← Where is MMS in your Chatbot Strategy? We have explored some interesting industry sectors who are adopting MMS in our earlier blog articles, including automotive, fashion and beauty brands, property and more. Another industry which is perfectly suited for MMS messaging and for instance, the delivery of coupons, is the fast food industry. It is a wonder why more fast food restaurants are not adopting this medium more widely – as it allows you to directly target consumers on the go, around meal times or slower days; to keep a steady stream of customers through the door. Fast Food outlets are already producing enticing advertisements for meal deals, freebies and discount offers. You typically don’t need to look far when you walk inside your nearest fast food outlet as the ads displayed on walls, digitally on signboards and pretty much everywhere else! Not to mention the mass channel marketing they do across other mediums like print and social outside of the stores. 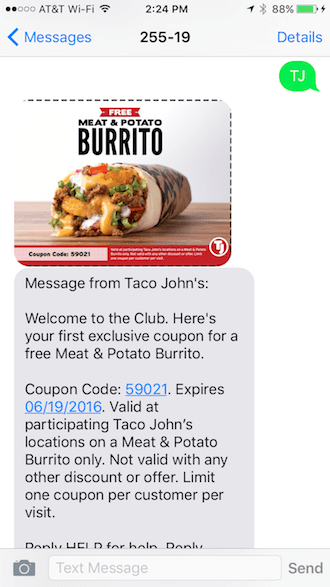 One such Mexican Fast Food Restaurant in the U.S. Taco John’s run a “TJ Awards” club whereby you can text into a short code to join the program. Subscribers receive a MMS welcome message along with their first MMS coupon. Each coupon has a unique promo code and finite expiry date. Once subscribed, customers receive up to 4 messages per month. It is a great use case for the fast food sector and a great means of attaining repeat business. If you are an agency or reseller wanting to send retail MMS campaigns for the fast food sector please contact us for more information and rates. We offer the best MMS rates in Australia. If you are an existing SMS provider looking for wholesale MMS capability via our MMS gateway – to offer your own retail customers then please get in touch via our contact form. If you have any other comments or questions, or would like to share your own successes with MMS in the fast food or restaurant industries, then free to leave a reply in the comment box below.